April « 2014 « Write, or Else! It brings disease to the young and innocent. At the end of the list, the finish line for this challenge, we have the Zagaz. This Moroccan spirit was responsible for bringing disease to newborns. He brought about one of the most common and tragic illnesses of his time, a form of tetanus which claimed the lives of many young babies. That’s the end of this blogging challenge! It’s been fun, spooky, and darkly inspirational! They are malevolent shapeshifters who feed on souls. They leave disease and putrid swamp in their wake. A Xiang Yao is a spirit with nine horrid heads on a large snake’s body. They bring disease and sickness, poisoning fresh streams into putrid swamps. They serve the great black dragon Gong-Gong, bringer of the great floods. It’s best to stay far away – an encounter is likely to leave you sick and weak. They are all around, bringing chaos and disease. Wekufe were evil beings in Mapuche believed were all around. They appear as animals, natural events or disasters, or disembodied spirits – when they choose to be visible at all. Wekufe can be called and controlled by sorcerers, but they usually rebel against and kill any sorcerer who lacks the power to fully control them. The shamans of the Mapuche, called the Machi, had to work constantly to ward the corruptions of the Wekufe away from villages and innocents. Existing between worlds, bringing madness and death. Vetala are spirits in Hindu folklore who inhabit corpses, using them as vehicles to wander about and attack the living. They cause madness in those who encounter them, and sometimes kill the weak and young. Some brave living souls try to capture Vetala – as beings existing between worlds and outside of physical laws, they know much of the past, present, and future. Most people, however, are smart enough not to try such a foolhardy act, and instead ward off the Vetala with prayer and chants. Could you carry her poor child, just for a moment? 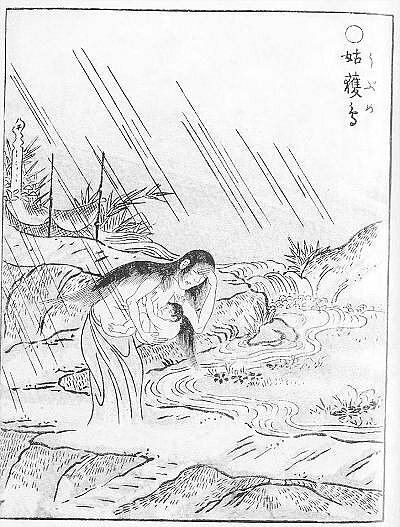 In Japanese folklore, the Ubume was the spirit of a woman who died in childbirth. She appears soaked in blood, carrying what looks like her swaddled infant. She often appears near rivers, begging passers-by to help her carry her baby across. Once someone takes up her child, she vanishes, leaving her victim compelled to carry the baby to safety. As the victim carries the ‘baby’, the bundle becomes heavier and heavier, until the swaddling comes off and the ‘baby’ is revealed to be a large stone, impossible to carry further. Some poor folk have then been pulled down by the weight of the stone, meeting a cold end as they drown in the river. They lure the unwary with the ultimate mask. In the jungles of the Philippine islands, there is an especially evil predator who cries like a baby. The seeming helplessness of a child lures in a well-meaning traveler, leading one to find an infant lost and alone. It is only after this poor traveler, guilty of nothing but a kind heart, takes in the ‘child’ that the true beast is revealed – and by then it is too late. A Tiyanak is a demon in human form. Perhaps it was once a child who died before baptism, who spent endless dark nights in Limbo before returning changed. It could be the unholy offspring of a human and a demon. It could even be an aborted or miscarried child, full of anger for its parents. Whatever they are, you most certainly don’t want to adopt one!